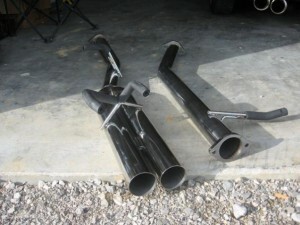 I recently bought ISIS’s new 3-inch Straight Through Race Exhaust. This exhaust has no mufflers or resonators and is 3 inches straight through, and splits into two 3 inch outlets at the axles. The wide open design is great for a turbo set-up and works fine for N/A KA. Installation of the exhaust is simple: unbolt, un-hang, bolt and hang. Everything went smoothly and was as straightforward as it gets. I suggest you get new rubber hangers if you are installing it on an older car because the stock ones are probably worn out and stretched causing the exhaust to hang low. 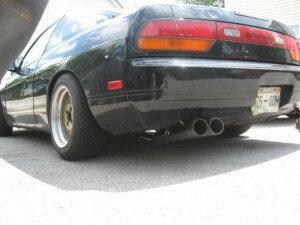 So you know, I have a header and test pipe in front of this exhaust. After I got it on, I fired it up and it is significantly louder than my previous dual n1 style exhaust. The sound is raw, loud, ridiculous, and awesome all at once. It’s loud, yet still sounds good. Driving around at low rpms it’s loud yet you can deal with it. At higher rpms, all hell opens up as you trumpet forward. If you want an exhaust that is no-nonsense and raw, this is it! NOTE: This system will most likely get you ticketed on the street. If you’ve got a dedicated track car, this is as bare-bones as you can get!